Being a science fiction fan has opened a lot of doors for me that I would never have thought to even knock on several years ago, and “writing the text for a museum exhibit exploring the history and representation of Asian Pacific Americans in science fiction” would definitely have fallen in that category; yet here I am, on my way to Seattle to because I got to do just that for the Wing Luke Museum’s new exhibit, Worlds Beyond Here: Expanding the Universe of APA Science Fiction, which opens on Friday, October 12, 2018, and will run through September 15, 2019. I’m excited to recognize many of the names of creators, actors, artists, and other notable APA figures in science fiction, but even better were the names I didn’t know and got to learn about while writing the exhibit text. I’m particularly thrilled the exhibit explores the topic of Pacific Indigenous futurisms as well. The importance of understanding what it means to be APA in science fiction, and to have our experiences acknowledged isn’t even a question in this exhibit—it’s taken as fact that our history and visibility matter, and that’s incredible to me because despite how much I loved science fiction growing up, it often felt like the genre and community didn’t actually love me back, or even care about people like me. And I know I’m not alone in feeling that way. I hope that by seeing this exhibit, others who have felt similarly will be able to see how in fact APA perspectives and creations are thriving in science fiction, and making more space and opportunities for more APA creators and fans to participate and be welcomed. Being a fan of science fiction (and fantasy) has in large part been the reason I’ve been able to connect with and learn from other Asian Pacific Americans about what it means to be part of a larger collective of marginalized cultures. It is because of science fiction and the many, many APA creators and fans I’ve met that only now, heading toward middle age, am I finally comfortable exploring the complex and often deeply painful questions of what being APA means to me, and how our portrayals in science fiction, pop culture, and beyond irrevocably shape our perceptions and concepts of identity. Contrary to what I’d been told and what I saw growing up, APAs are intensively active in science fiction, with contributions to and influences on the genre that are extensive and inspiring. 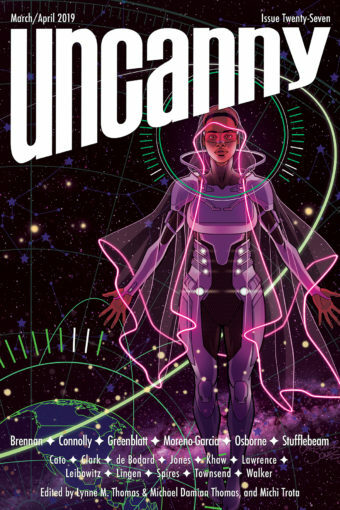 Our stories, our faces, our work, are irrevocably, proudly, part of science fiction, and I’m so proud to be part in this because not only did I write the exhibit text, I am also loaning my first Hugo Award (2016) as Uncanny Magazine’s Managing Editor, for which I became the first Filipina to win a Hugo, to the exhibit for the next year! A whole museum exhibit dedicated to highlighting APA history in science fiction, and getting to be a part of it, means more to me than I can say. The fact that the exhibit opens during Filipino American History Month is also deeply meaningful (*waves at all my Fil-Am Spec Fic Fam who are too numerous to name*). Writing the exhibit text was probably one of the most challenging things I’ve done, because how can you distill decades of history and do justice to just how much APA creators and fans have done in science fiction? I hope what I’ve written for the exhibit makes it clear to visitors why representation matters, because science fiction has been an important part of how APA creators and fans see ourselves, the art and stories we make, and the worlds we’re able to imagine. It matters that we can see ourselves, and that others can see us, in a genre that has enormous influence on the world and cultures around us. Above all, I hope it’s clear that there is space for all of us in science fiction, and that space is continuing to grow. Now all it needs are more of us to fill that space with our stories, our art, our visions. Get to it, friends, we can’t wait for you to join us. Many thanks to the Wing Luke Museum for extending this opportunity to me, especially Exhibit Developer Mikala Woodward for her infinite patience and encouragement.